One of my favorite Sunday Times features is actually in the Real Estate section. No, not listings. It's Christopher Gray's "Streetscapes" column, a kind of weekly excavation of old buildings, gone buildings, and other curiosities of NYC history. This photo, a column earlier this month, is especially approppros in light of the splendid new revival of Sondheim's Follies. 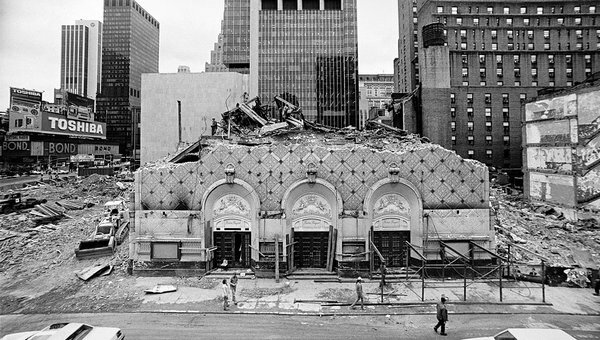 The image above is of the half-demolished Helen Hayes Theater (not the current Helen Hayes Theater) in 1982. The Hayes (on 46th between Broadway and 8th Avenue) and an adjoining house, the Morosco, were leveled that year, but not without a spirited fight from the New York theatre community, who came out in large protests. Follies, you may recall, is set in an old Broadway theatre about to be demolished, haunted by the ghosts of Ziegfelds past. In fact, legend has it the inspiration for that 1971 show came from a Life magazine photo of aging star Gloria Swanson in the wreckage of the then-recently demolished Roxy Theatre (see below). And where is the current revival of Follies playing? At the Marquis Theatre. Part of the Marriott Marquis hotel--the very building the Hayes and Morosco were torn down to make way for. Thanks for including that photograph of Swanson in the ruins of the Roxy. I wonder whether it's possible nowadays to shoot such images. Not hard to imagine that regulations and/or fear of lawsuits would prevent it. I tell ya: if we can't play in the wreckage of our theaters, whose wrecked theaters can we play in? Intriguing theater history. I love that Swanson photo. Did they really auction off the piece of the facade of the Helen Hayes. My husband and myself were students at the time and I worked for The Shuberts. I remember the morning I woke up to discover workers took a jack hammer and "jacked" a line across the facade. It was originally all supposed to be saved. Nothing bad happened but the City had them take a piece that was not destroyed and it was supposed to be saved and incorporated into a future theatre on Broadway. Was it sold? We left New York after that because our "heart" was broken. Working for the Shuberts, the destruction of the 5 theatres, the rise in HIV, and the way every interview I went on for a theatre job seemed like a casting couch were the reaons we left. We returned and went to see Follies at the Marquis and I accidentally peed on the floor but then started laughing.